"Because of the emphasis Turnbull placed on presentations, I now have confidence to speak in front of an audience." A wealth of resources, including a primary and junior grades Library which houses over 3,000 books with a computerized circulation desk networked to each classroom, results in Turnbull students acquiring strong literacy skills and a real love of reading from a young age. At the primary and junior level, we launch each school year with a Celebrate Reading time. Special activities, games, and guest readers set the tone that literacy has value and fun at Turnbull School. Visiting authors and poets further promote good literature and the process of writing. 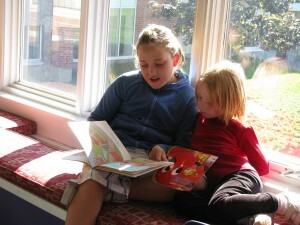 Reading buddies are a favourite time of the week when each junior student is paired with and mentors a primary student. Together they share the enjoyment of reading, as well as writing and listening activities. This is yet another way Turnbull School builds nurturing relationships within the school community. Guided Reading: Small groups of students work together on reading books, poems, songs, fiction and non-fiction texts. Reading skills and strategies are directly taught to students and practised during Guided Reading activities. Writing: Students from K-3 use the Six Traits Writing model, where they learn and practise using the six traits of effective writers. Students learn to write personal and expository texts, poetry and report writing. They learn basic editing skills and to use the writing process as a tool to hone their writing skills. Working with Words: Students practise phonics and phonemic awareness skills, develop strong sight word vocabularies, explore word patterns, grammar and technical skills, and learn strategies for becoming strong spellers. Self Selected Reading: During this component of their language studies, students select and read books at their reading level, listen to high quality literature read by their teachers, engage in peer sharing of books, visit the school library and read with older reading buddies. Speaking and Listening: Students have many opportunities to develop their expressive and receptive language through show and tell, current events, storytelling, project presentations, assembly presentations, plays and Reader’s theatre activities. Reading and Writing Progress: Individual progress is carefully assessed and tracked using a variety of assessment tools, both standardized (the Developmental Reading Assessment), and anecdotal. In addition to the regular Language Arts periods, students engage in many reading and writing activities that are integrated into other curriculum areas (for example, students read the words of a play on the rain forest in science class, or on the continents in social studies activities). Reading Skills & Comprehension: Students are exposed to a variety of literary genres through novel studies, short stories, book reports, poetry, fiction and nonfiction texts. The Developmental Reading Assessment is used as an evaluation tool twice a year to track students’ progress throughout their time in the Junior School. Writing Skills: Junior students continue to expand on their understanding and use of the Six Traits of Writing model, where they learn and practise using the six traits of effective writers. Students learn to write personal and expository texts, poetry and report writing. They complete formal spelling and grammar lessons on a regular basis, develop editing skills and learn to use the writing process as a tool to fine tune their writing skills. Oral Communication: Students have many opportunities to develop their expressive and receptive language through formal and informal presentations such as current events discussions, storytelling, project presentations, assembly presentations and plays. In addition to the 10 Language Arts periods that the junior students participate in each week, Language Arts activities are frequently integrated into other curriculum areas (for example, plays written and performed in Drama class, reading and writing activities in Social Studies, such as the Model UN). 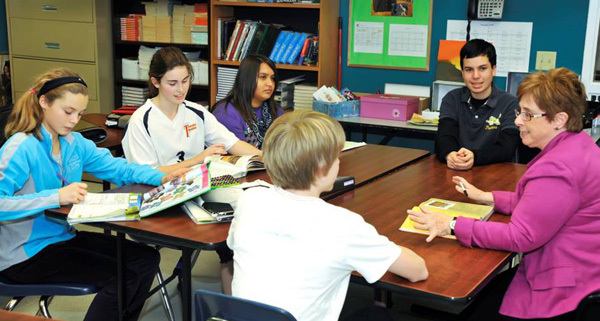 Students’ abilities in Language Arts are closely monitored by their teachers. Enrichment opportunities are available to those needing to be challenged (for example, enriched level spelling groups, more advanced writing activities, higher level reading and comprehension groups). Our Grade 7 and 8 students enjoy both informal and formal literature studies. The teachers facilitate two or three different novel study units, often at the same time, thus providing varying levels of challenge that meet the learning needs of all students in the class. For example, in Grade 8, the teacher may work with one group of students on a novel such as The Giver, by Lois Lowry, while she teaches another group of students a more ambitious piece of literature typically seen in high school, such as Of Mice and Men by John Steinbeck. In informal Book Club meetings, senior students explore a wide range of novels and poetry with their peers. In more formal literature studies, students delve into poetry, short stories and novels, and into theme, metaphor and symbol, learning to ask: what is the essential question the author is exploring? Our Grade 8’s also meet Shakespeare in an enjoyable, interactive manner that leaves them looking forward to more of this great literature in high school. While our students experience a very enriching literature program of novels, poetry and short stories, we also emphasize the importance of developing strong basic skills involved in writing. The students focus on the importance of always following the writing process: brainstorming, planning, organizing, revising and editing. We emphasize both creative and expository writing: a major focus for the Grade 7 and 8 students is the ability to develop and express ideas in clear and effective prose, both in formal and creative writing, ensuring that our students are well prepared for the essay writing they will face in high school and beyond. Many cross-curricular assignments bring relevance to their writing as well. To complement the writing program, students are also given a strong grounding in grammar. Turnbull students graduate with strong literacy skills and an interest in English that leads to much success in high school and beyond.